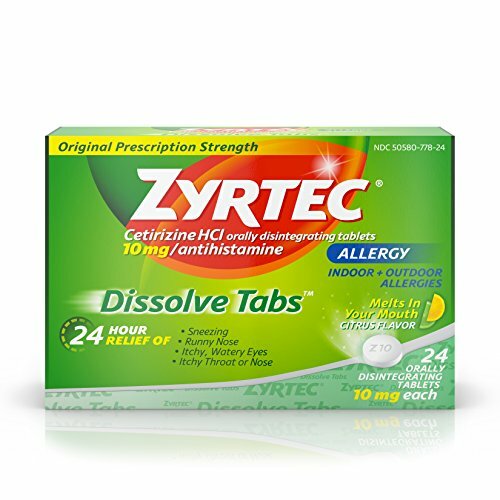 Get temporary relief from symptoms of hay fever and other upper respiratory allergies with Zyrtec Dissolve Tabs. It relieves runny nose; sneezing; itchy, watery eyes; and itching of the nose or throat. Each tablet contains 10 milligrams of cetirizine hydrochloride and melts in the mouth. Tablets can be taken with or without water. Please see product Drug Facts for full product information. If you have any questions about this product by Zyrtec, contact us by completing and submitting the form below. If you are looking for a specif part number, please include it with your message.